by Dr. Lance D. Collins Ph.D (Editor), Dr. Bianca K. Isaki Ph.D (Editor), North Beach-West Maui Benefit Fund, Inc., publisher. This is a solid collection with narrative, detail, photos and maps, tables, charts, stories and references. It could easily serve as an intermediate to advanced course in Hawaii's economics and history yet it remains accessible to a broad range of readers. Hawaii has a unique and complex history. How did we arrive at the tourist destination that is modern Hawaii, and what preceded it socially and economically? Become a time-traveler as the authors take you through periods of discovery, development of a fully sustainable economy, interaction with the West, the smothering of and replacement of that original economy, and right up to the present moment marked by contention for the use of limited island land. Editor Lance Collins' chapter takes us on a historical and geopolitical tour. As background he summarizes the formation of the Hawaiian Islands from their geological origins though the arrival of Austronesian-speaking people and the establishment of a societal system that persisted until it was abolished by imposition of Western concepts of property rights. Everything a reader needs to know about the influence of outsiders and the resulting illegal overthrow of the Hawaiian Kingdom is here. But there was a second "regime change:" the overthrow of agriculture and ascendence of tourism as king of the economy. This material goes beyond others that simply chronicle the path to the overthrow or to statehood. What makes this chapter unique is the attention it pays to the disposition of the Crown Lands. Collins' inclusion of cases such as Hawaii v. Office of Hawaiian Affairs (2001) updates readers on the legal struggles to preserve the public land trusts by Native Hawaiians. There is the pressure on land and society brought by colonization and tourism. Collins exposes the efforts of the state to use what should be those protected crown lands for other purposes. Collins has painted a complete picture that should inform advocates and anyone interested in the struggle for affordable housing or for the preservation of Native Hawaii rights. As tourism continues to externalize much of the costs of labor onto society at large, the crisis of affordable housing continues. The state has taken on a limited role in trying to address the issue. However, with the range of choices available to it, the state has repeatedly sought to use the crown lands as the foundation for the building of affordable housing under plans that also allow the development of market priced homes on those same crown lands. The state has not seriously considered or proposed using the power of eminent domain approved in Hawaii Housing Authority v. Midkiff, 467 U. S. 229 (1984) to take land from speculators and developers to build affordable housing. Given these choices, it is clear that the"crisis"of affordable housing and its solution in the alienation of crown lands is first and foremost as a means to dissolve Hawaiian society and dispossess the Hawaiians of their lands. The struggle to protect crown lands is a means to protect a Hawaiian future in a time-space beyond the world market and the flows of capital. Editor Bianca Isaki's chapter preserves and contrasts memories of Maui's plantation days with the invasion of tourism and its eventual dominance of the economy. The chapter is divided into three parts: the first presents the memories of retired Pioneer Mills workers. Part two opens with the story of "Makekau," recalled as the only homeless guy at the time, with background for the changes taking place as young people left to escape the declining plantation economy. The plantation economy morphed into the tourist economy, which is the theme of the third part. Isaki describes the very narrow scope of existence of plantation life. Tourism offered increased opportunities brought by outsiders. And both preyed on traditional Hawaiian cultural values and practices. It worked for the tourist industry to describe Hawaiians as incompetent, lazy and otherwise inferior. At the same time, Hawaiian women are presented as being sexually available. 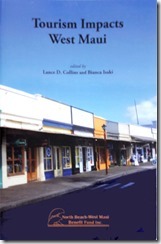 Within the following seven chapters by other authors are lessons in how urban planning is practiced (or not) in Hawaii, and how real-world problems such as traffic congestion and the influence of soaring land prices are considered (or not). Stories of workers who migrated to West Maui from the Philippines are here. Day-tripping tourists drove road construction, we learn, not the needs of residents. This very rich material makes the book hard to put down.